Replacement plus additional print for Paula. Photo from a few days ago of a painting in progress for the show. James Tryin. His business card says 'just TRY-IN-ART'. Anthony Donatelle with a chocolate covered pancake. Two painted ladies try to charm their way ahead of me in the pancake line. It didn't work. I'll have a half dozen or so larger pancake portraits for sale and will be reciting spontaneous street pancake poetry at the Pancakes and Booze Art Show (and Art-A-Whirl after party) at The Loft @ The Barfly in downtown Minneapolis, Friday May 20th from 8 pm to 2 am. Feel free to interrupt me. My Princess Beatrice paper hats have been doing rather well on Ebay. That and preparing paintings for the upcoming Pancakes And Booze Art Show this Friday evening in Minneapolis has temporarily stymied my output of small originals on Ebay. Thanks to CNN's The Situation Room for requesting one half dozen hats last Friday. You may see Wolf Blitzer sporting one of my creations soon, or you may not. Please note that my infatuation with silly paper hats is a passing affair. My real love for fanciful headwear is pancakes, the painted production of which I'll be returning to shortly. This is a fabulous artistic facsimile but obviously impossible to confuse with the original, hand-constructed by a semi-famous artist and completely ready to flaunt. Comes with a generous length of ribbon which attaches accessory to head as pictured. Waggles a bit when you strut. I'll post this to Ebay at 9 Central US time this evening. A painting of President Barack Obama naked on Penelope The Unicorn. 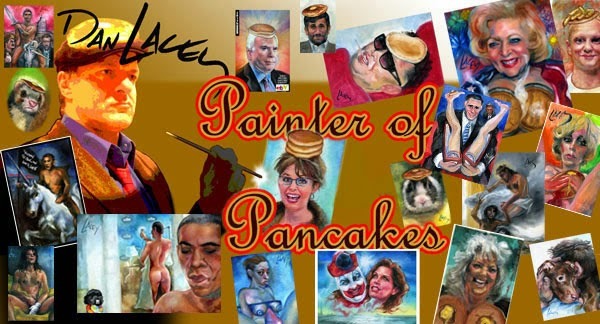 This was originally a painting of Obama naked on a unicorn with Angelina Jolie, but I decided the painting would work better if her head was made out of pancakes. Painted from the now famous White House / Osama Bin Laden raid conference room photo. set it from now on at 9 pm central US time.